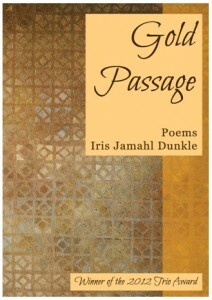 Iris Jamahl Dunkle has had work in Boxcar Poetry Review, Kaleidowhirl, Cleveland in Prose and Poetry, Thin Air, Fence, SNReview, Squaw Valley Review, Stellar Showcase Journal, Verse Wisconsin and Washington Square. She’s been teaching creative writing in both university and community environments for the past eight years, and is the author of Gold Passage (Trio House Press, 2012). 1. What’s some writing advice you’ve received, that works for you? I can remember back at NYU, Sharon Olds and Jean Valentine would always say that there is no rush to publish. I was a young MFA-er (22) and I was all ambition and drive. Sharon and Jean taught me to slow down and to accept that good work, and finding ones voice, takes time. Now, in retrospect, I’m really glad I waited. 2. Can you say a little bit about the genesis of your book? My book, Gold Passage, began as a manuscript back in 2000. Many of the poems were from the thesis I wrote at New York University in 1996-1998. But, over the years, I stared weaving my new work in. What really brought the book to life was a poem-a-day project I did four years ago where I wrote everyday about the history of where I am living now: the house and property where I grew up. The project caused this lyric shift in me. I was also so lucky to win a prize at a press that really cares about the work they publish. The editors at Trio House Press worked tirelessly with me to edit and reshape my work until it became the book it is today. 3. Have you had to sacrifice anything in the rest of your life to write? What a question! Yes. I wake up at 5:00 to find time to write. I have two boys, ages seven and nine and they generally wake up between 6:30 and 7:00. If I wake up at 5:00 I’m guaranteed at least an hour (after the coffee kicks in) of uninterrupted writing time. I also use all other forms of quiet time I find: commutes, plane rides (sans kids), when the classes I teach are journaling. To get all of this time though I have to give up T.V., a clean house, a meal here and there. It is well worth it though. 4. Do you think writing helps you to understand more about yourself and the world, or is advancing as a writer more about learning how to communicate the things you already know? I don’t truly understand anything until I’ve written about it. For instance, I grew up and now live in Sebastopol, CA. It’s a small agricultural town north of San Francisco. Growing up here in the 70s, we learned very little about the native inhabitants of our area: the Coast Miwok. In fact, we were taught that no Coast Miwoks existed. I was really disatisfied with this information and I kept revisiting it in my writing. Why were they gone? What happened? As it turns out, the Coast Miwok still exsist, they were just not a recognized tribe until the 1990s because of paperwork errors. Can you imagine that? A whole people erased due to a paperwork? I love the mysteries that history offers. There is so much that is written down wrong and I feel like it is our job as writers to find all those stories that have been left under and bring them back up for air. This was written by joannemerriam. Posted on Thursday, April 11, 2013, at 1:35 pm. Filed under Poetry, Um... yeah. Tagged Intermittent Visitors, Iris Jamahl Dunkle. Bookmark the permalink. Follow comments here with the RSS feed. Both comments and trackbacks are currently closed.